Hmm. Wonder what corner of the ruling class that would benefit. His own, perhaps? This article is making the rounds — in a walk-of-shame kind of way — the object of much comment. 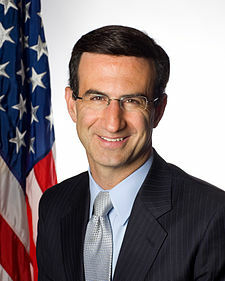 Its author is Peter Orszag, late of Exeter and the Obama administration, and a man who recently gestated into the loving (and providential) arms of Citigroup. That “debt-limit debacle” was the one that Obama caused, because he wouldn’t accept Mitch McConnell’s offer of a clean bill. And those “automatic policies and depoliticized commissions” sound a lot like the twin horrors of the Catfood Commission (aka Simpson-Bowles) and the congressional “bipartisan” Super Committee set to kill the recovery (and slice down the safety net) the minute they convene. The best way to read Peter Orszag is as a Social Security–hating Obama surrogate who also represents Wall Street billionaires — the Dem-supporting elites who aren’t as socially conservative as the Koch Bros-type oil-and-gas billionaires who support Republicans. These policy areas [Orszag’s issues like “climate change, the hard slog of recovering from a financial slump, and our long-term fiscal gap”] may sound like dry academic subjects. But they are thoroughly infused with, and ultimately shaped by, moral beliefs. There are, after all, infinite combinations of spending cuts and tax increases that can add up to the same bottom line. Deciding what should get trimmed and what taxes should be increased or decreased involves questions of favoritism, welfare, compassion, fairness and all sorts of other subjective judgments not answerable by the “laws” of economics. Madmen in authority — thus he refutes Orszag. On the other hand, props to Peter for playing his unique hand — a made man with OMB cred and an economics background, who can write. He’s managed to climb up from low-end retainer (permanent denizen of a Thank You think tank) to an higher-end one (temporary denizen of a Thank You bank). I suspect his reach will exceed his grasp (meaning, he’s reached or is approaching his ceiling), but we’ll see. It’s an interesting niche he has, a sort of non-professorial Jared Bernstein with techno-seeming cred and a fast-expiring shelf life. If Rick Perry is the next president, that bank won’t need him forever.